Difficulty reading this e-mail? Click here to view an online version. Welcome to Issue 24 of the LCUK eNewsletter. 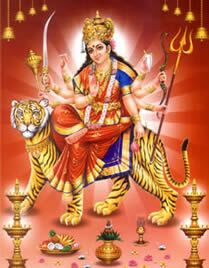 This is a very busy time for everyone with Navaratri celebrations. Most of the Lohana Mahajans are celebrating Navratri in some way or he other. On behalf of The President, Executive Committee and the Trustees of the LCUK I wish you all a very happy Navratri. 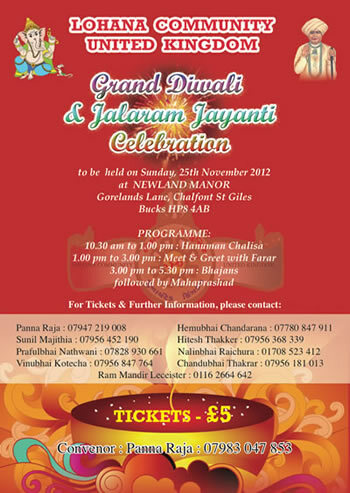 The LCUK is organising a Grand Diwali and Jalaram Jay anti celebration on Sunday, 25th November 2012. The Grand celebrations starts with Hanuman Chalisa followed by various different activities throughout the day. Tickets are only £5.00. Full details of the programme can be found below. The Lohanamatchmaker.com web site is re-launched. The site has a new look and feel with a functionality that works. The site will allow you to set your parameters for potential partner search. The format is such that you will meet your potential profiles in your own space and time. The site is wholly managed by the LCUK which assures you the safety that fowl play will not be tolerated. The functionality that is built into the site offers the organisers to hold events to help in the process of meeting your life partners. The site methods does mirrors the style of matchmaking that has been part our culture that you will feel comfortable with especially if you are concerned about introducing your sister or daughter to this site. The site in operating on a non- profitmaking setup with an ethos to provide a well needed service. The site has been developed in the UK on the latest platform with the latest technology on protecting personal data on the site. Soon we will advertise the site on the Asian network and will organise matchmaking events of many kinds all helping towards that one goal to ensure matchmaking works. The site has been proudly supported by the Dhamecha Group. To experience it, the eligible lohana , just log on to www.lohanamatchmaker.com and make it happen. I thank the president Pannaben Raja, Hiteshbhai Thakar, Subhashbhai Rajani, Shakherbhai Kakad, Sunny Chotai and the committee in the help and support on this project. Convenor of the Matrimonial Sub-Committee of the LCUK. To subscribe to this newsletter then please send an email to subscribe@lcuk.org.uk from the email address that you wish to register. Are you looking for a previous edition of the LCUK Newsletter? Then please click here to visit our archive library of eNews letters. Promote your business to our database of 5,000 Lohana families across the UK. Please email advertising@lcuk.org.uk for more information about our advertising rates. Ashton-U-Lyne, Birmingham, Bolton, Cambridge, Coventry, Derby & Nottinghamshire, Leicester, East London, North London, South London, West London, Loughborough, Luton, Manchester, Milton-Keynes, Northamptonshire, Norfolk, Peterborough, South West & Wales Southampton Southend on Sea.